Health care systems worldwide are faced with the challenge of improving the quality of care and decreasing the risk of adverse events. The finding that providing evidence from clinical research is necessary but not sufficient for delivering optimal care has created interest in knowledge translation (KT) – the scientific study of methods for closing the knowledge-to-practice gap, and of the barriers and facilitators inherent in this process. Policy makers, funding agencies, clinicians, and researchers recognize the need to facilitate the implementation of knowledge into practice. Implementing evidence can lead to improvements in cost and outcomes. 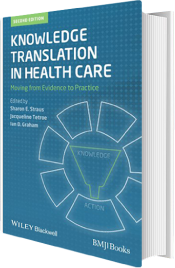 This website is based on the publication “Knowledge Translation in Health Care: Moving from Evidence into Practice” by Sharon E. Straus, Jacqueline Tetroe, and Ian D. Graham. 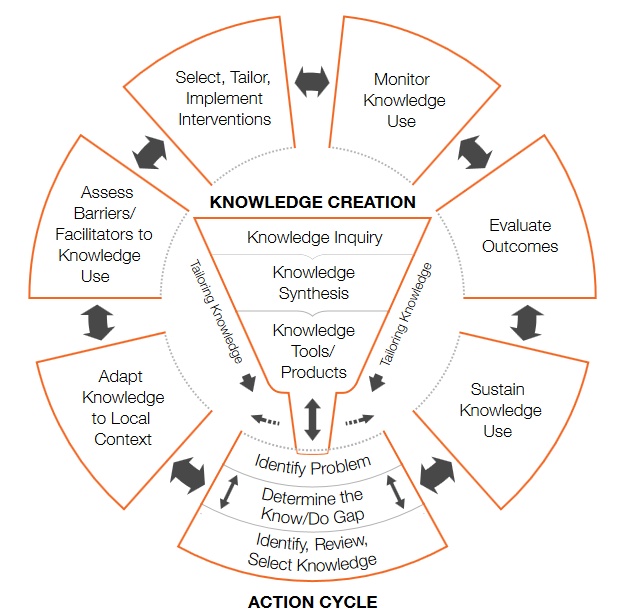 This publication uses the knowledge-to-action cycle as a guiding framework to define and describe KT. It also outlines strategies for enhancing KT capacity and implementing of KT activities. The Canadian Institute of Health Research has defined knowledge translation as “a dynamic and iterative process that includes synthesis, dissemination, exchange and ethically-sound application of knowledge to improve the health of Canadians, provide more effective health services and products, and strengthen the health care system”. The significance of KT is that knowledge creation (first-generation research), distillation (creation of systematic reviews or second-generation research), and dissemination (appearance in journals) are not usually sufficient on their own to ensure appropriate knowledge use in decision making. Increasing recognition of these knowledge-to-action gaps has led to attempts to effect behaviour, practice, or policy change. Efforts must be made to close the knowledge-to-action gaps by using effective knowledge translation interventions, which can thereby improve health outcomes. Knowledge translation research aims to improve health care settings by doing the following. Exploring how to measure gaps in decision making. Improving knowledge synthesis and distillation. Enhancing methods for diagnosing and measuring the determinants of knowledge uptake. Determining the effectiveness and sustainability of different KT approaches and effect modifiers. For more information, please refer to the publication [“Knowledge Translation in Health Care: Moving from Evidence into Practice”] (2013). The knowledge-to-action cycle is a conceptual framework developed by Graham and colleagues that is built on the commonalities found in an assessment of >30 planned-action theories. The knowledge-to-action cycle is an iterative, dynamic, and complex process. It involves both knowledge creation and knowledge application (action cycle) with the boundaries between the creation and application components being fluid. Figure 1 illustrates the knowledge and creation funnel and the major action phases of the knowledge-to-action cycle. This website has several sections to help you learn about knowledge translation and its significance in health care systems.